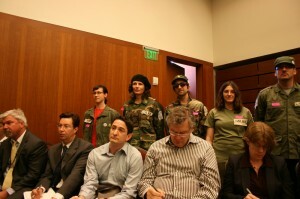 UC Berkeley grad students don homemade military uniforms in protest of proposals for expanding the availabilty of online courses. Grad students are also waiting for the pending health care program to take effect. Photo by Julie Eng. Yudof said that these more sustainable methods of operation will include ending furloughs this summer, providing further support for graduate students, and reducing UC Office of the President (UCOP) expenditures. Cuts to the UCOP included the elimination of 400 office printers for a savings of $300,000 a year. Reinvesting these administrative savings into academics was mentioned frequently throughout the meeting by several regents. Yudof briefly outlined the benefits of redirecting these funds over the next few years. The seats in the public seating area were nearly all occupied. The meeting opened with a public comment period. Individuals — representing a number of different facets of the university — addressed the regents, including graduate students, post doc students, a UC parent, and union members from the Association of Federal, State, and Municipal Employees (AFSCME). After the public comment period concluded, Yudof began his opening remarks, but members of the unions halted proceedings as they exited the room, chanting and clapping in protest of current UC policy regarding campus workers. Also critical of the proceedings were several graduate students dressed in G.I. garb. The students’ satirized a comment made by UC Berkeley Law School Dean Christopher Edley that “squadrons of GSIs” will “frontline online contact.” Edley’s remark was made in support of UC Berkeley’s plan to move to increased online courses. Graduate students were a hot topic at the meeting, as issues of adequate stipends and health care were raised by regents and student representatives. Graduate students at all campuses excluding UC San Francisco will now receive vision and dental benefits in their health care plans. All campuses’ health care programs will be centralized as a UC-wide plan, saving over $1 million. Student Regent Jesse Bernal is optimistic about the efficacy of this new program. “In the end, some campuses may be losing some autonomy that they had, but, overall, it will be benefiting the entire system,” he said. The two-day meeting on May 19 and 20 was Bernal’s final meeting as student regent. Student Regent Designate Jesse Cheng will replace Bernal as a voting member in July. The candidate for student regent designate to succeed Cheng was selected May 18. His identity had not been revealed as of press time. Although Cheng could not disclose the new student regent designate’s name, he is looking forward to working with him. “He represents a very specific, really different part of the student population that other student regents have not brought in the past and I know that I don’t have,” Cheng said of his future colleague. While it was Bernal’s last, Wednesday’s meeting was the first for newly appointed Lieutenant Governor Abel Maldonado and Regent George Kieffer. Also present was Regent Sherry Lansing, who was recently reappointed for her second 12-year term. Lansing said her reappointment came at a critical time for the UC. She said that her return will enable her to continue her work on the issues that the UC currently faces.